As you could tell by my recent posts I turned over a new leaf this January. Actually, I climbed out the tree crossed the creek and went into the city! Maybe it’s cause I found my high school diaries (and Adult Shawna needs to go back in time and have a serious Chick-Talk to Teenage Shawna). Maybe it’s cause my last baby is out of the newborn stage and ready I’m to get off my couch and out of my pajamas. Either way, something is different. As we have recently enacted some TV reduction I’ve been geeking out hard to podcasts. I heard a podcast called Confront Your Junk, it featured Leigh Kramer talking about a personality profiling called Enneagram and thought, who doesn’t like a fun personality test. So I started looking into it and it has changed MY LIFE! An ancient personality typing that looks like an ole hippie drew it up in the back of her used bookstore alongside her homemade chai tea and patchouli of the world collection. But if you ask me, this is legit and has changed my life. 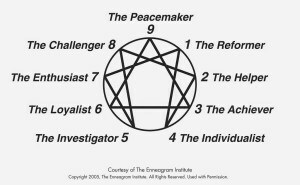 What is different about the Enneagram? We can do lots of tests based on our external behaviour (shy/outgoing, creative/analytical, etc.) and they are fine but we a) don’t really learn anything new about ourselves, and b) have different results depending on who we are with or how we feel. For example, you may be more aggressive and confident at home then you are at work. 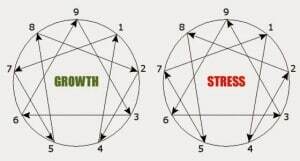 The Enneagram doesn’t slot you into a box or colour. Sure you get a number but the personality typing looks deeper. It is based on your motives, fears, and desires – all which are demonstrated by various behaviours depending on how ‘healthy/secure’ you are. It looks at the sum of who you are – all the blind spots and ‘bad habits’ we have when feeling insecure. It also looks our strengths and unique abilities when we are feeling secure in who we are. We all have a basic personality type (our number) but we also have personality components of the types beside us (called our wings). Sometimes leaning more to one side than the other. So if you are a Type 2 (the helper) you also have traits of either a Type 1 (the perfectionist) or 3 (the achiever). Then there are the lines that connect each type to two others. One line is your ‘Direction of Integration’. When you are healthy and undergoing positive growth you will pick up the positive traits of this other type. So when a Type 2 is healthy they take on healthy qualities of Type 4 (the creative). The opposite is called ‘Direction of Disintegration’. When you are experiencing stress you will pick up the negative traits of this type. For instance, the Type 6 (the loyalist) will pick up unhealthy traits of the Type 3 (the achiever). How do you find your type? You can take some tests to help you narrow it down. There are a few free ones online, but if you borrow/buy a book (see recommendations at the end) they often have tests in them to help you determine your type. All in all, the best way to find out is to take your time to read through the nine types and see what resonates with you. They say that when you find your type you will feel kind of exposed, for me I felt a little humiliated, but also, I felt seen. I know the Enneagram it’s not for everyone, but I’ve found it so valuable. It took me a while to pinpoint my type but as I read more and more (and listened to yet another podcast) it became really clear to me which type I was (I’m a nine by the way). As I learned more about being a nine. I started to reflect on the persona I had built as a facade in response to my struggles. It was like I woke up to who I really was. Things I brushed off as ‘just a habit’ or feelings, patterns and thoughts I try to conceal/bury were brought into light. I had to own them. This was a humbling but freeing experience. It was mortifying. I could see my unhealthy habits seep into my parenting, my marriage, and my past. It was revealing because it was explaining so much about my motives, about why I’ve made life decisions in the way I have. It was also empowering because I could see what my strengths were too. I had spent too much of my life compensating for or denying my weaknesses, and now I can focus on being who I really am by working in the area of my strengths. It was freeing because I could see the range of who I am and almost feel acceptance over the wholeness of who I am, the ‘good’ and the ‘bad’. I am able to catch myself when I’m acting unhealthy. I am able to stop in the moment and realize why I am reacting to stress in the way I am. I know I’m not perfect, I have blind spots like everyone else but I feel like I am able to be a work in progress because now I better see most of the work I need to do. I could go on and on about how it is changing my heart and mind, and there is so much more to say about the Enneagram – but I’ll leave it here. There are lots of free and paid tests to find your type. This is a great (free) assessment I just found that so far has been pretty accurate for those I know have used it. Try to answer these alone, as honestly as possible – thinking of your history of behaviours. They say the best way to find your type is ultimately to do some reading through the types and see what is hitting a note with you. When you find your type you will feel almost exposed, maybe embarrassed, and probably a lot of ‘aha’ moments. If you want help finding our your type, or you know your type and you want to chat it up drop me a message, email me, or tell me on Instagram and we can nerd out together.